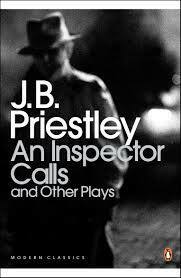 An Inspector Calls by J.B. Priestley I really enjoyed reading this book. I mainly enjoyed the contrast between the older and younger generations and how that showed through the different characters. The twist at the end was really good and I would recommend others to read this and watch the play. I thought that this poem showed true emotions of pain and sadness. This was very surprising to me because it’s supposed to be a poem of love and passion. The contrast between these strong emotions is what makes it a beautiful poem. I thought this poem also has a contrast between love and pain. The narrator constantly repeats the title “I’m in Paris with you”, but isn’t in the same relationship that he’s referring to. The poem has definitely come from the heart and it has true meaning. I got a strong feeling that this poem is referring to war. The way it is written is beautiful and some parts really do seem like the true meaning of it is war based. It’s a very loving poem for such a horrific sacrifice. I like this poem because I think a lot of people could relate to it. It shows the happy and sad sides to a relationship. Nothing sugar-coated to make things look better than they are. It’s very truthful.